Do you have a themed Christmas tree? A random mismatched Christmas tree? More than one tree, decorated differently? Also, do you use white lights, colored lights or both? 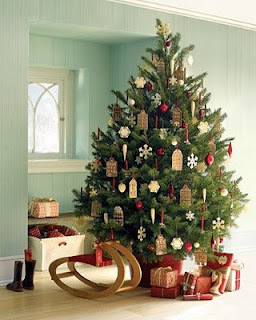 Andrew Ritchie showcased a bunch of themed trees today from Martha Stewart living, even the gift wrap is a perfect match. I particularly love this one! We finally got our tree decorated this weekend and the only theme is "Our Life". I love the "our life" theme. I'd have to call ours that too. Hubby buys me a new "Our First Christmas Together" ornament every year. This year we have colored lights, but we have had all white too. I guess it depends on the mood at the time. although i love the look of themed trees, my house has a random look with lots of different ornaments that have accumulated throughout the years. my mom likes to change up the lights every so often too and this year we have solid purple lights! im anxious to see what you decide on! happy decorating! Tamy: That is so sweet of Skip! Ok, first, awwww Tamy. I think that is so sweet. The tree lights change year to year. This year Bren made it very clear that he wanted lots of color. We have ornaments galore, those w/ a few added candy canes here and there, completes our tree. This year we have made an addition that we are thrilled about. A train to run it's course under the tree. Oh I love the addition of a train! I bet it looks so cute! I hope you share some photos Monique! Our theme is "too busy moving to create a perfect tree so we bought a Charlie Brown one and let the kids do themselves"! I have always wanted to do a theme tree, but every year at this time the budget is tight and I just put up all the lights, beads and ornaments I have collected over the years. It always looks so great I forget about the theme tree I wanted to do! I have 4 decorated trees in my home... FUN!!! 1 is decorated by moi! 1 is decorated by my mom. 1 is decorated by sons and hubby. 1 is decorated by my youngest son and it is in his room. my older son usually has a tree in his room, but he said he didn't want one this year...hmmm. Melissa: I've been reading and I have no idea how you are managing! Fifi:I really want to do 3 trees, but hubby said the one was more than enough work... I have the other two... they are tall and thin and I envision them done up in a Scandinavian theme. Oh well... Le Sigh... ;) I'll live :) Maybe when we have kids to help he'll go along with my plan. The regular tree isn't themed at all... A mismatch of our lives... it's lovely! Thank you for the header compliment... I wanted something I could keep up beyond the Christmas season! Personally, I love a tree that has meaning from years of collecting. But, our tree may look crazy to some :)!